A university professor in Shimoga had the fore-sight to make his home nearly autonomous from various public utilities, and alongside do his part for the environment. And when his neighbours were slow to learn, he set out to educate them too. Shree Padre reports. At the house-warming ceremony in this new home in Shimoga's Lal Bahadur Shastri Nagar, Dr Sreepathi presented all the guests with a specially written booklet, printed at considerable expenditure to himself, about roof water harvesting. He had decided, during construction, that he would harvest the rain falling on his roof, choosing this option first, and digging an open well only later. And having made his choice, he decided he would teach others about it too. "Showing by practice is the best way", he says politely. The house, constructed four years ago, has a total capacity to store 30,000 litres of rain water. A 20,000-litre tank is under the dining hall. The other one, with half as much capacity, is beneath the portico. "Won't worms grow in the stored rainwater?" A lot of visitors to his home ask this question, and Sreepathi, true to his 'showing by practice' way, decided to test the water in the tank in April 2005. Despite having been stored for months since the previous monsoon, the water was still potable. As it turned out, for Sreepathi, the choice of a harvesting system in preference to relying on the open well was prudent too in more than one way. The first problem was that the well yielded slightly saline water, and the roof-top rains were therefore much needed for cooking and drinking. Moreover, since the construction of the house, Sreepathi has been measuring the water level in his well every month, and he's been thankful not to have relied on it much. "Though I'm recharging my open well, the annual decline rate of water table around here is alarming. It was 18 feet below ground in April 2004. Two years later, it had fallen to 23.5 feet. A decline of 5.5 feet in just two seasons", he worries. The house, in fact, is a total harvesting zone for rain water. Excess water from the sump is used to recharge the ground well. Even grey water, i.e. water that has been already used for washing and bathing, isn't wasted, either. 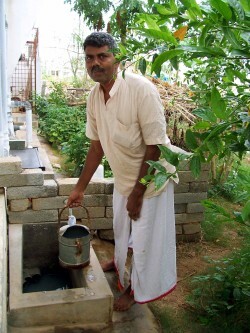 A separate open pit is constructed at the back of the house to gather this; every morning, Sreepathi manually fills this water in a rose can to drench his vegetable plants. Even in summer, the plants don't require separate fresh water. Picture: Grey water is used for irrigating the family's kitchen garden. The family's eco-friendly practices are much older than the house itself. For the last 12 years, they haven't taken any waste material outside their compound; instead, it's composted and used for their kitchen garden. Sreepathi uses a bicycle for his local trips, while his wife Mamatha, a college lecturer, moves on an electric-powered moped. Whenever the sun permits, cooking in the home is done using a solar cooker. Hot water for bathing is also obtained courtesy of the sun. Indeed, so much is the home's reliance on solar power that the house is itself named Vibha, a Sanskrit word for the sun. Even during the nights, it's the sun that keeps the house lit, thanks to solar lights that store charge during the day in batteries. The house's careful design also permits natural air-flow. During summer, air flows from south west direction. To guide that air-flow inside, the north side windows are fitted with vertical projections called wind breaks. Surprisingly, there is no electric fan or light inside the home. Electricity has only two uses here - for the motor pump and for the fridge. Though municipal water is available, Vibha hasn't taken a connection. The roof is twelve feet above the floor. The height and the hollowness of the roofing material keep the interiors cool. The terra-cotta hollow tiles have air gaps inside. These act as insulation and reduce heat transfer. Compared to concrete, the thermal conductivity of clay - from which these roofs are made - is much lower. As such, the heat transfer is lesser. A solar-powered exhaust fan connected to a PVC pipe from inside the tanka opens into the bed room on the first floor. Once it is switched on, it facilitates the cool air to come up and enter the room. "All these arrangements keep the house 2 to 3 degrees cooler than the neighboring houses", points out Sreepathi. There are houses elsewhere in the state that have adopted only water harvesting, or solar lighting, and a few have both. But Sreepathi is yet to come across a house that has as many eco-friendly features as his Vibha. Vibha draws many visitors. Every week 2-3 people come to have a look at that 'new type house'. That makes a minimum of 500 visitors a year. "Though there are water shortages, very few people get convinced about rainwater harvesting", observes Mamatha, "One major mental block is about the potability of stored rain water. The impression is that the tap water is best. Those who construct new houses don't mind getting granite stone all the way from Rajasthan, and paying for that. Still, for them, the one-time investment for rain harvesting appears to be expensive." Interest in eco-friendly housing is luke-warm, says Sreepathi, because engineers and contractors don't endorse this. Also, for most people, eco-friendliness is attractive only if they can see the economic benefit of it, and with the power tariff still low, there is no incentive to move towards solar lighting. Adds Sreepathi, "Even if they save 10 per cent in the expenditure on flooring, they can make a dependable arrangement for water. Rs.30,000-40,000 would provide them a good storage structure that will provide year round water." Take Shimoga's Ashwathanagar locality, for example. Houses here don't have municipal water supply. Not a single open well here has water. The number of bore wells is increasing. Though they have Sreepathi's live example nearby, they don't mind waiting for hours in queues for the tanker water than independently tapping the rain. Recently, as a result of Sreepathi's constant encouragement, two families - that of Madhava Shastry and D S Ramakrishna - have now started utilising rain. "In the entire city, only about 35 families that are harvesting rain", tells Sreepathi with disappointment, "Except these examples, the city is far far behind in water literacy." To fix that, the professor has been spending considerable time and efforts to popularise rain water harvesting in and around Shimoga. At Jawaharalal Nehru National College of Engineering where he works, he has floated an organisation, Chirantana Club to create awareness about sustainable living. He himself has written dramas on water conservation and had them enacted by students. In the last three years, he has held 60 awareness programmes on rain harvesting, on request by various organisations. In 2002, a group of good-hearted citizens had started a Task Force for Rain Water Harvesting in Shimoga to offer guidance to those interested. Elsewhere in Karnataka, thanks to media coverage, thousands are interested in harvesting rain on their own, but unfortunately, there is nobody to show them how. In Shimoga, the irony is that a band of people who are ready to guide others do not find many takers. Of late, the situation is slowly changing, perhaps as a result of increasing need for the citizens to have autonomous solutions. Sreepathi himself has guided a few families in the recent past. One outstanding project out of this is at the cultural centre Gamaka Bhavan at Hosahally, in the outskirts of the city where a 1.75 lakh litres tank is being constructed below the stage. The top of the tank would be the dais. Shree Padre is a journalist with many years of experience in agricultural reporting. He is the author of several books, including one on rainwater harvesting, published by Altermedia. Dr Sreepathi can be contacted at (08182) 274 952, Mobile: 94480 00643, or sreepathi_lk@hotmail.com.